26 MMS March 2017 mmsonline.com RAPID TRAVERSE Machining Technology in Brief machine installations across the country. 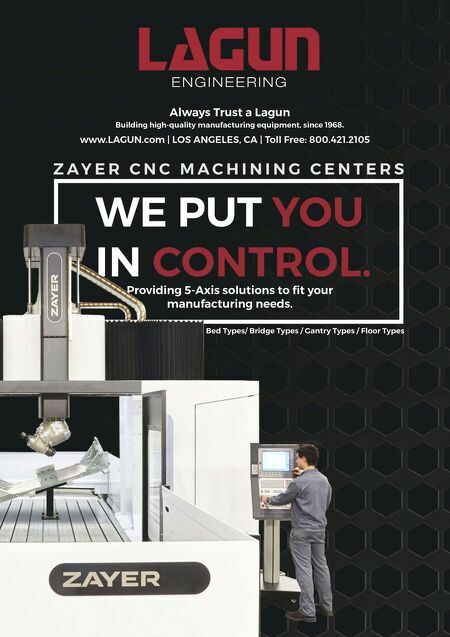 During the installation process, each machine tool is leveled in the X and Y planes in nine dif ferent positions. Traditionally, technicians place two bubble (or "spirit") levels on each position, and then adjust the machine accordingly to bring it level. This process is slow and cumbersome, Mr. Schmedake says. Spirit levels take time to settle once they are in position, and they don't quantify how far the surface is from level, making it dif- ficult to judge how much adjustment is necessary. There are also ergonomic drawbacks, as the technician has to get up and down repeatedly to check the levels and make the adjustments. A different device the company acquired largely solved these problems and might have applica- tions for end users of machine tools as well. The device is a digital level. The DWL-3500 X Y level from Digi-Pas that Hurco technicians use is powered by four AAA batteries or via USB, and features a digital readout and inclinometer. The digital level proved to be faster to settle than the old spirit models (according to Digi-Pas, measurement speed is less than five seconds) and can measure both the X and Y planes simul- taneously, replacing the two levels previously The Digi-Pas DWL-3500 XY levels in two planes simultane- ously and quantifies how far the surface is from level down to one- thousandth of a degree. Bluetooth connectivity enables technicians to view the reading from a distance on an Android device running the company's app. 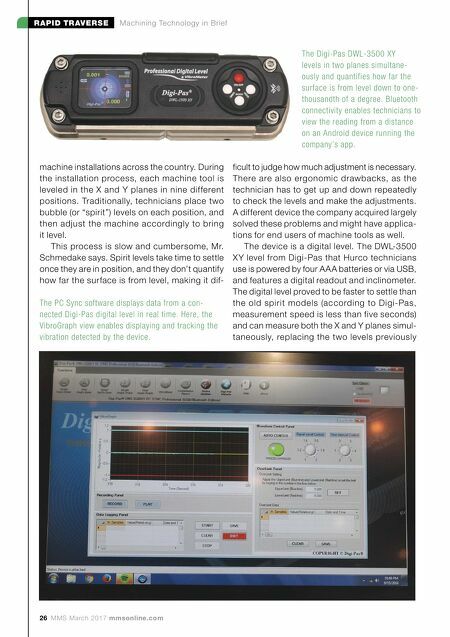 The PC Sync software displays data from a con- nected Digi-Pas digital level in real time. Here, the VibroGraph view enables displaying and tracking the vibration detected by the device.